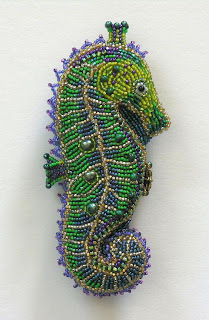 I am continuing to work on my bead embroidered figural designs. My current project is a turtle pin. I have completed my seahorse etui box which can now be seen on my web site along with several other of my designs. I have updated and redesigned my web site which is now organized by category. 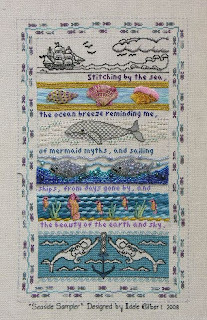 I designed the Seaside Sampler for the ANG Needle Artists By The Sea group for their 2009 yearlong project.